There are printable coupon for Free Small Tots when you buy any Sonic Premium Beef Hot Dog. Offer is valid till August 10th. Limit one coupon per person. You must present this coupon when purchase to get the deal. 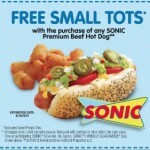 Not valid with combos or other offer.